DualShockers recently talked with Final Fantasy Brave Exvius Producers Kei Hirono and Hiroki Fujimoto about the popular mobile game’s future. Final Fantasy Brave Exvius will soon be entering its fourth year in Japan with over 35 million confirmed downloads globally and only continuing to trend upward in popularity. Combining Square Enix’s iconic Final Fantasy franchise with their mobile series Brave Frontier, Final Fantasy Brave Exvius boasts hundreds of characters mixing the best parts of both aforementioned titles with the uniquely addictive Gatcha, or as the developers call it “Summon”, style of progression. Complete with art direction from series veteran Yoshitaka Amano, Brave Exvius stands out amongst an ever increasing slew of mobile RPGs in a unique sense. The game offers a quality side-scrolling experience for gamers new to the series in the age of mobile gaming, along with old school gamers who miss the 2D sprite based RPG format. As Square prepares for another year of content and the launch of a tactics spin off called War of the Visions: Final Fantasy Brave Exvius, we had the chance to speak with producers Kei Hirono and Hiroki Fujimoto to discuss War of the Visions, setting up crossover events, and where the game is going. Vanessa Brangi: What are the biggest ideas in Final Fantasy Brave Exvius that came from Square Enix’s work on previous handheld Final Fantasy RPGs? Kei Hirono: The biggest idea that lies behind Final Fantasy Brave Exvius is creating a novel game experience that marries these two elements: the pixel art that has adorned the early titles of the Final Fantasy series, and the CG art featured in newer titles in the series. VB: What inspired the team to go for a modernized version of 2D pixelated sprites again and how much freedom has this given you in designing them? KH: This game initially arose from the respect we felt toward the early titles in the Final Fantasy series. The visual expressions found in the Final Fantasy series have a history, from the pixel art that was used from Final Fantasy I through Final Fantasy VI, to the 3D CG art in Final Fantasy VII and on. We design the pixel art in the present title with the series’ history in mind, and aim to create visuals that show what it might look like if the series as a whole had continued using the pixel art of Final Fantasy I through Final Fantasy VI instead of adopting 3D CG art. 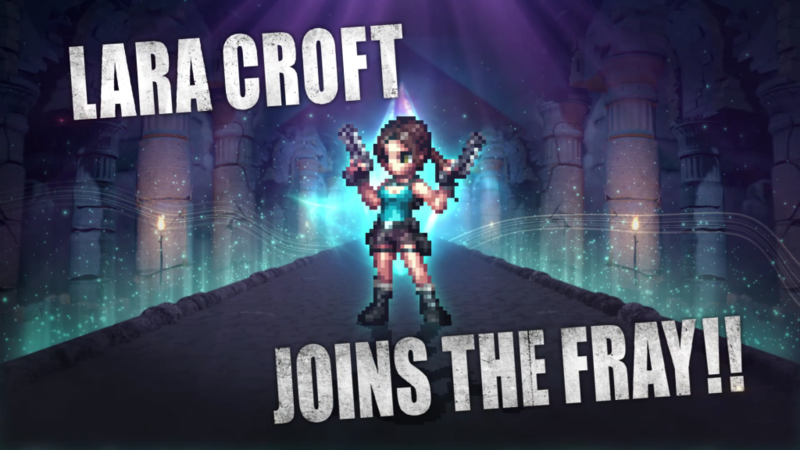 Every title in the Final Fantasy series takes on a new challenge, so we evoked that same spirit, designing our pixel art with the freedom that is characteristic to this series. VB: How closely tied is the current Final Fantasy Brave Exvius team with the one creating War of the Visions? Will players be able to transfer any data between the games? KH: The teams are completely separate from each other, but there’s good communication between the two as they exchange information and share assets. Things like this are relayed back and forth through key members like me. In regards to transferring data, I can’t answer at this point in time. 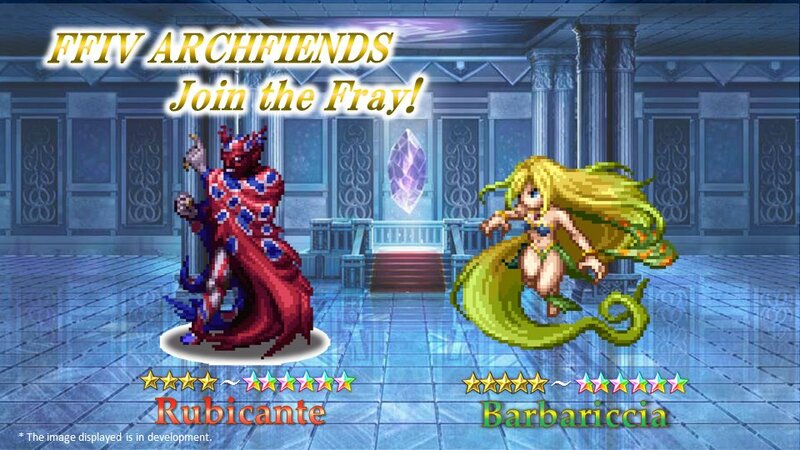 VB: Final Fantasy Brave Exvius has been home to many crossovers. What are the biggest challenges the team runs into when planning one of these crossovers? Hiroki Fujimoto: In Final Fantasy Brave Exvius, whenever we participate in a collaboration, it’s important to us to ensure that both sides are able to benefit from it. We incorporate compelling characters and worlds from the other collaborator into Final Fantasy Brave Exvius, thereby heightening the value of Final Fantasy Brave Exvius and having our players enjoy these elements as they appear in the game. Simultaneously, we want to help spread the word about, or contribute to heightening the value of, the collaborating title through various elements such as the Final Fantasy Brave Exvius world, the scope of Final Fantasy Brave Exvius as a platform through which to share information, and awareness, to name a few. As such, it can be a bit of a challenge to adjust the timing and content of the collaborations to benefit both parties involved. VB: This game has surprisingly collaborated with pop singers like Ariana Grande and Katy Perry. Why did the development team decide to put celebrities in the game? How do these crossover events perform when compared to ones with other games? KH: The biggest reason we had for collaborating with these celebrities was that we wanted as many people as possible to play Final Fantasy Brave Exvius. We thought the best way for the game to be seen by people throughout the world, without the boundaries of video games, countries, or age, was to work with a celebrity. After all, by limiting our collaborations to those held with just other games, we would end up revolving around people who are gaming fans already. As a result of our collaborations with these singers, many non-gaming fans started playing the game as well. VB: Many people would like to get into Final Fantasy Brave Exvius, but are intimidated by the Gatcha system. Has the team ever considered a subscription based model for the game that doesn’t conflict with the Gatcha framework? HF: A subscription-based system is something that is under consideration, but there are no concrete plans for it at this time. There’s no need to be intimidated by the Gatcha system (we refer to it as a “Summon” system in the game). As you move through the game, you’ll be able to obtain Lapis, which is the material necessary to perform Summons. On top of that, there are plenty of opportunities to enjoy Summons for free, such as through login bonuses and limited time events. It’s not made in a way that requires players to pay money in order to have fun, so please don’t fret about this as you play. VB: What are the biggest differences do you see in players’ tastes and approaches toward the game between regions like Japan and North America? HF: The biggest difference is play time. Compared to Japanese players, North American players spend more time out of each day playing the game. For this reason, we hold in-game events four times per month in the Global version, while we hold them three times per month in the Japanese version. We provide more content than in the Japanese version in the hopes of keeping Global players engaged longer. VB: The Japanese version of Final Fantasy Brave Exvius will turn 4 later this year. How has the development team adapted to make sure the game stays relevant and how much longer do you plan on supporting the game for? HF: The Japanese version turns four this October, while the Global version turns three this June. These past four years have felt long at times, but at the same time they’ve really flown by. The fact that we’ve been able to keep on with this game thus far is thanks to all of the players who play this game. I’m truly grateful. We receive many comments, and there are a great many points that we haven’t been able to reflect, but I hope that the players will continue to support the game, and that they’ll enable Final Fantasy Brave Exvius to continue pushing content out in the five, ten, and thirty years to come. We are developing content with the serious ambition of supporting this game for the next thirty years. VB: Is there anything else you would like to share with DualShockers’ readers today? 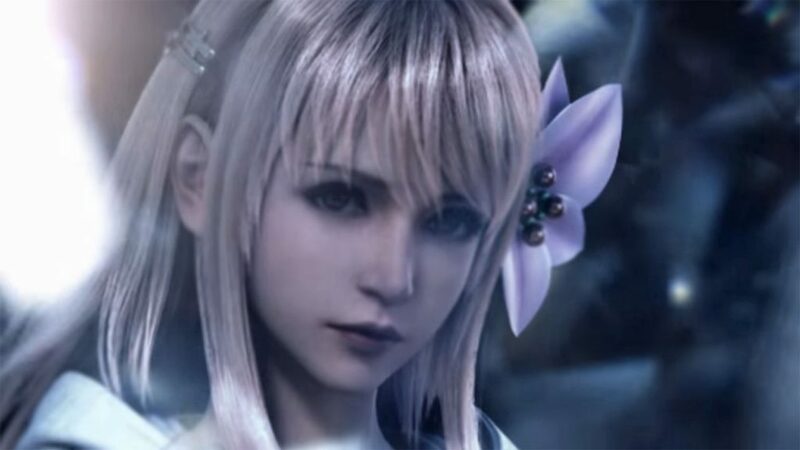 HF: Popular characters we know and love from the Final Fantasy series will continue to appear in the game. Additionally, we also have plans for some highly popular original Final Fantasy Brave Exvius characters to appear as units. I hope you’ll look forward to them. Final Fantasy Brave Exvius is free to play, and can be downloaded from the Google Play or Apple Store; meanwhile, War of the Visions: Final Fantasy Brave Exvius will be released in Japan this year. Personally, I’d recommend that veterans of the Final Fantasy series should jump in and give Brave Exvius a try if they haven’t yet. We’d like to thank Kei Hirono and Hiroki Fujimoto for taking the time to answer our questions.